Gyms around the country are rockin’ and rollin’ with new members popping up left and right. Gyms are packed to the brim, equipment is limited, and finding a spot to even workout is often tough. Unfortunately, this does not last long because according to CNN, close to 80% of gym-goers let their memberships go unused for a large part of the year. See, when it comes to working out and having a gym membership, CNN points out that people often don’t think about whether or not they are willing to make the time commitment to get to the gym 3-4 times per week. And looking at the stats, 80% of people don’t think this through very well as we continually see gym memberships going to waste. With unused gym memberships comes wasted money, frustration, lack of results, stress, and more. That’s exactly why I like having a back-up plan. EXCUSE #1: The Gym Is Too Crowded And I Can’t Find Equipment to Use. I mean the Daily Mail wrote a full article about people complaining that the gym is too crowded. Listen, you do NOT need a gym or equipment to start building your best body ever. Having a gym and some equipment is a nice perk, however, your own bodyweight is the best piece of equipment you have to start transforming your body. EXCUSE #2: I’m Too Busy And Just Don’t Have Time. Ahh, the “I don’t have time” excuse… This is a year-round excuse that is often times the most common of excuses for why we don’t workout. Once again, there is a solution to this horrible excuse… Whoever said you needed to workout 6 days a week for a 1-2 hours a session? Ok, some “fitness experts” say this and are completely wrong… All you need is 15-30 minutes and 2-4 days per week to start reshaping your physique. If you stay consistent and work hard during your workouts, your body WILL transform! EXCUSE #3: I Am Just Lazy. Listen, if you focused on doing just 3 workouts a week for 21-days, I can guarantee your “lazy” attitude toward working out would be drastically changed. And what better way to build a habit than to do it in the comfort of your own home? You don’t need a crowded gym, equipment, or even very much time. The good news is all you need is a small space on the floor, a little willpower, a smile on your face, and these 10 NO Excuses Workouts to get you incredibly fit. 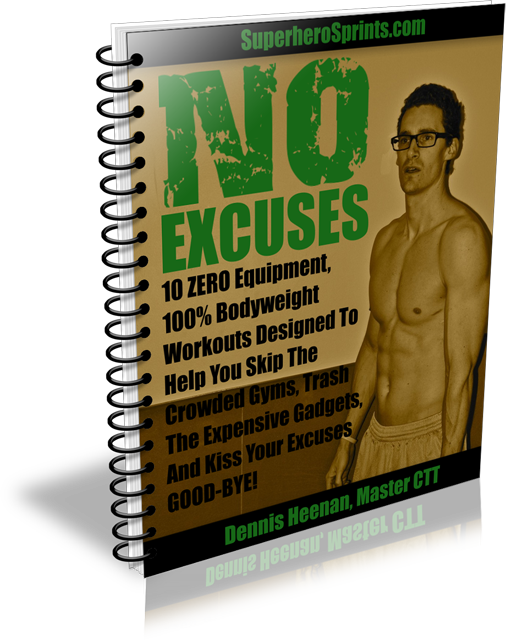 And TODAY ONLY you can get 10-Brand New NO Excuse Workouts that I designed so you NEVER miss a workout again. These are straight to the point workouts that require ZERO equipment and just 10-30 minutes of time. And today you can get them ALL for ONLY $9.95. 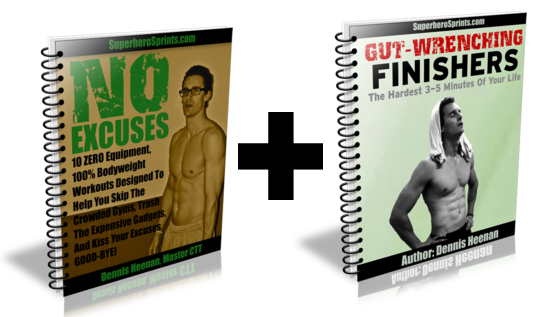 Get a FREE copy of my most intense finisher workouts that I have EVER created… 7 Gut Wrenching Finishers that are guaranteed to be the hardest 3-5 minutes of any workout you do. That’s 17 Workouts That Are 100% Bodyweight And Can Be Done Anytime, Anywhere with ZERO Equipment! Go through the workouts, test drive the program, and get the results for a full 60-days and if for whatever reason you are not satisfied, all you need to do is email me and ask for your money back. 1. Do I need equipment for these workouts? None at all. Zero, zilch, nada. Just your bodyweight and a small space on the floor is all that is needed. 2. I am a beginner, can I use these workouts? Absolutely. The workouts are challenging, however, anyone can do them. Some of the workouts consist of exercises that are perfect for beginners. 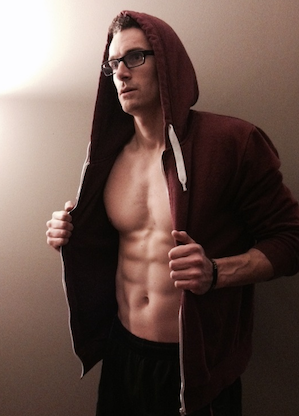 This is a great program to help beginners progress into harder and harder workouts. 3. Will I have to wait for the workouts? No! They are delivered INSTANTLY for you to download and start within the next 30-seconds. So if you have an excuse coming on right now, choose one of the 10-workouts on the program and get after it. 4. I want to lose my belly fat, will those workouts do this? Absolutely. Losing belly fat is all about strategically working at a high intensity which is exactly what you will be doing in these workouts. Get ready to say good-bye to your excuses AND belly fat. 5. What if I am more advanced, will I still be challenged by these workouts? 100%! All of the workouts can be catered to the most advanced workers. I use these workouts often right here at home and continue to be challenged by them each time.